Very few modern Christians who read English are unfamiliar with the writings of CS Lewis and JRR Tolkien. Lewis’ expositions of Christian thought as well as his popular fiction (The Screwtape Letters, The Chronicles of Narnia, Out of the Silent Planet, etc.) have become modern classics. Tolkien’s The Hobbit and The Lord of the Rings has become something of an industry unto itself and has spawned an entire genre of literature. Many people know that the two writers were friends and colleagues, and some are aware that they belonged to a group of friends known as the Inklings. Few, however, are aware of the conversations and ideas that bound the Inklings together. They were not only Christians (for the most part), but committed Realists who struggled to put into words something of the world as they believed it truly exists. This is the deeper side (the Deep Magic) of their writings – a side I think that speaks to the heart of many in the modern world – though they don’t know why. I’m going to tell you why. The Inklings were not a group of men who invented something. They were a group of men who had a shared affinity, something which brought them close to one another despite their differences (It is said that Lewis always had something of his native Northern Irish prejudice towards Roman Catholicism, a troublesome point for Catholic Tolkien). What they shared was a Realist view of the world – a belief that the material world is more than material, and that the symbols, meanings, values, etc. that coinhere within matter are more than ideas – they are real. Beyond this theological/philosophical commonality, they also shared a belief about the nature of myth. And here I must be careful to define what is meant by myth. In popular usage, myth means a story that is not true, much like the popular usage that says that a symbol stands for something that is not present. For these men, myth was a form of story – but of a primal story, a shaping story. Myth was a story that is profoundly and deeply true, even if its various manifestations have deficiencies and discrepancies. In the process of his Christian conversion, Lewis relates the account of an evening with a visiting atheist. Early in 1926 the hardest boiled of all the atheists I ever knew sat in my room on the other side of the fire and remarked that the evidence for the historicity of the Gospels was really surprisingly good. “Rum thing,” he went on. “All that stuff of Frazer’s about the Dying God. Rum thing. It almost looks as if it had really happened once.” To understand the shattering impact of it, you would need to know the man (who has certainly never since shown any interest in Christianity). If he, the cynic of cynics, the toughest of the toughs, were not-as I would still have put it — “safe,” where could I turn? Was there then no escape? Eventually this would become a core belief for Lewis. “It all happened once.” And so, he would eventually not only not be surprised that there should be other stories of dying and rising gods – he expected it. And he expected it, because the the death and resurrection of Christ are not just historical but also mythic. It is a primal story, even the primal story, one that shapes all stories. Tolkien said less about such things than Lewis, but they were equally part of his thought. His creation of Middle Earth, complete with languages, grammar and a back-story (The Silmarillion) that would rival the ancient epics of most civilizations, was not the hobby of an eccentric Oxford don. It was the life-work of a man whose instinct for the mythic required such an effort. On some level, certainly as an expression of myth in the way it is being used here (and as the Inklings themselves used it), the stories of Middle Earth are true. They are certainly far more true than any story found in the pages of a modern Newspaper. Another member of the Inklings, Owen Barfield, was a lawyer by profession. However, Barfield was a former Anthroposophist and a profound Realist. His theoretical writings, such as Saving the Appearances, are much harder to read than the relatively popular works of Lewis and Tolkien. But both men thought of Barfield as the true theorist within their number. Tolkien, reflecting on Barfields’s work, said, “If God is mythopoetic, then we must become mythopathic.” This is to say that if God’s primary mode of revelation is through the instrument of mythic stories and events, then we ourselves must be open to understanding such mythic expressions of realities. Strangely, myth (in their use of the term) is far better suited to expressing Realism than any possible materialist account. And this brings us to my original point: Why do the imaginative works of Lewis and Tolkien speak to the modern heart as much as they do? They do so because they are true! But the truth that they relate is a truth known primarily by the heart and it is this dynamic that gives myth both its nature and its effectiveness. In the Voyage of the Dawn Treader, Lewis introduces us to Eustace Clarence Scrubb. Eustace has been raised by “modern” parents and has a thoroughly materialist view of the universe. This renders his character deeply problematic in the mythic world of Narnia. It is his inward change that forms the primary narrative of the novel. Becoming mythopathic in Narnia is more than a philosophical change for Eustace – it is salvation. The same can be said for the rest of us. The assumptions and narratives of materialism (both in its atheist and Christian forms) are not only incorrect, they can be productive of bad character, leading us away from God. The mythic nature of the world (reflected in the Inklings’ version of Realism) is a reflection of the child-like innocence that Christ enjoins on his followers. Adults who are too “wise” to be fooled are always dangerous characters in Lewis’ novels. In the life of the Church, there is a primary “mythic” experience: the Liturgy. Liturgical action is more than an antiquated manner for having a Church meeting. It is the ritual, sacramental and symbolic enactment of a Reality that might otherwise not be seen, understood, or experienced. That same reality, presented in a non-mythic manner, would be less accessible and probably misunderstood. Tolkien was right: we must become mythopathic. The attraction of Lewis’ and Tokien’s writings are witness to the fact that there is a deep mythopathic part even in the modern heart. This is not a modern phenomenon – it is a human phenomenon. It is the anti-mythic character of modern culture that sets it apart from all human cultures that have come before. The reduction of the world to a narrow, materialist understanding of fact, is simply a world unable to communicate God. Lewis used the term Tao to describe one aspect of this mythic Reality in his book, The Abolition of Man. He meant no particular version of Taoism – only that there is a deep Way (Tao) of things that anybody with any sense at all (to say it in a Lewisian fashion) should know. That so many no longer perceive the Tao of things is a testament to a world increasingly populated by versions of Eustace Scrubbs. But even Eustace came to know the Tao of things. We may pray for the same. There was a two year period when I read through the Trilogy seven times. I became so involved that one day when I was somewhat dejected and reading about the call on Frodo’s life to fulfill the task of the Ring’s destruction, I prayed for Frodo. I prayed for Frodo. And, after praying for Frodo, my depression lifted! I do not know if this has anything to do with this. But I am in a conversation with my evangelical sister, and related how that the Elf Maidens have been such a type for me of the Mother of God and of Holy women saints, and she connected with that. She has worn the jewel of Arwen because of the ‘something’ she felt in those characters. This has opened a conversation about Orthodoxy with her. First time ever. Very good stuff here. Well said. Robing Phillips has also written several excellent articles about Nominalism & Realism. Highly recommended. There is a fine line between searching for truth and searching for facts. Thanks again for an illuminating post Father! You are amazing. 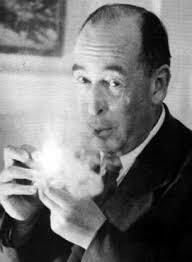 My life and Christian experience has not been perfect because of CS Lewis, but I have always felt encouraged in the TRUTH of it all through the writings of CS Lewis — and thank the Good Lord Who Loves Mankind, we have almost everything CS Lewis has written! Thank you Fr. Stephen! It is interesting that when the new Testament was translated into Chinese, Logos, the Word was translated as Tao, the underlying thing of everything. Fr. Stephen, you are right when you say that many do not perceive the tao of things.I was raised in a family that did not perceive the tao, but I did. Very difficult. It is an uplifting state to encounter others who see the world beyond the material, to acknowledge the unseen entities who are members of the narrative in our universe. The materialistic world view does not even effectively express or explain the phenomenons of happiness and sadness. Such is the materialistic and industrial way of life Lewis and Tolkien made enemies in their works. Having made the study of Tolkien and Lewis something of a life’s work, I read this with great pleasure. Thank you, Father. Thank you Father Stephen. This puts into clear words something I have struggled with all my life. what exactly is the wonder that small children and artists respond to, and that we ‘sensible ‘ adults have lost ? A phrase that has stuck to me is that myth is something that is false on the outside but true on the inside. WHat the mystic in me met in the Orthodox Church was a certainty that we are enmeshed in the eternal ,alive , unchanging and yet vibrant living life of God. It really was coming home to walk into an Orthodox Church where people where people lived in this reality. Paul, while I understand you statement about facts and truth, I would suggest that they are two very different categories altogether. It is impossible to know what facts are unless one first knows the truth about the nature of things as facts always depend upon context for their ‘factness’. Joe Friday notwithstanding, facts never speak for themselves and to insist only on ‘facts’ will never get one to the truth. The materialist and the nominalist tend to confuse facts with truth something a realist would never do. It seemed to me that Paul understood this. 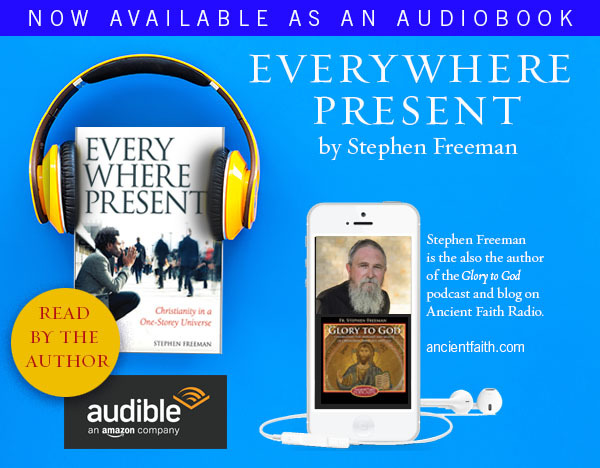 Being a student of both history and theater in my younger years and being raised by parents who were certainly not nominalists, I was exposed to the fullness of things and the mythopoetic nature of reality early and often. It put me at odds with the norm from the beginning but ultimately led me to Jesus Christ and the Church. Along the way my exposure to the ancient Greek plays, Shakespeare and the traditional forms of prayer such as Native American dances that began to give me an appreciation for the sacramental. I read Joseph Campbell’s works on mythology in high school in part because my aunt had worked as a typist for him during the preparation of his original manuscripts. I was amazed to find out later that he was vehemently anti-Christian. I never understood that as his work pointed so clearly to the fulfillment of all in Jesus Christ. At least that is what I got from it. There was an excellent book that I read 40 years ago that I don’t know if it is still in print: “The Tao of Physics” which was an early attempt to link sub-atomic particle physics with a more traditional, non-materialist understanding of creation. Much food for thought. 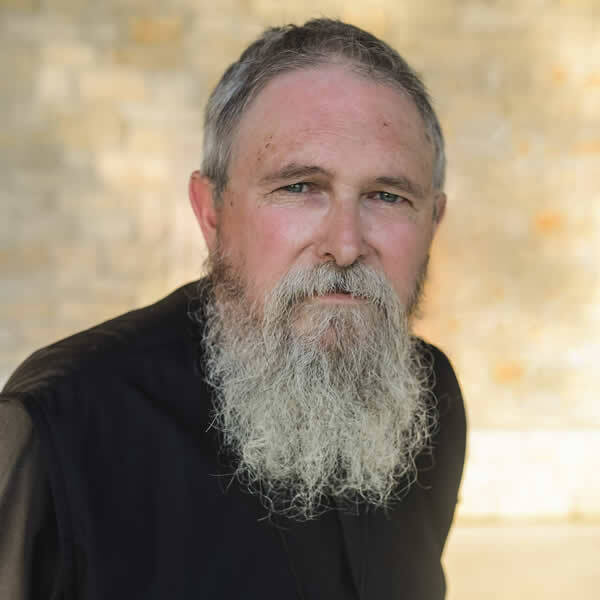 There is a rich and extensive depository of literature out there, most of which (shameless plug) can be found through Eighth Day Books, the best bookstore in the world, IMAO which also happens to be an Orthodox ministry run by a fellow parishioner. It can be accessed on the web. My husband and I read the Chronicles of Narnia aloud over nine months to our seven year old terminally ill daughter and truly, we experienced a sense of the reality of the mythic. Many times the passages we read seemed astonishingly appropriate to that day’s events, for example one day at the hospital we were sent to a different waiting room (for only one family) and on the white board someone had written a Bible verse and drawn a stick figure of a person jumping off a cliff. I wondered about that for a few minutes until the doctor arrived. He had especially bad news- the cancer treatments had not worked and he was not sure that there was anything left to try.That night at story time, Jill jumped off a cliff, only to find herself carried by Aslan’s gentle breath, blowing her to safety. We also jumped into what felt like thin air that day, but trusted in God’s breath to carry us. When the last days came, our little girl asked us if she were dying and we gently told her the truth. After a bit, her response was that she was a little excited about getting to meet Aslan. She’d been nurtured in the Orthodox faith, and understood that she would be meeting Jesus, but she could relate so comfortably to Him as Aslan that that is what she said. A few days later, reality and myth came together for me again when a stranger handed me a toy stuffed lion during my daughter’s visitation. The books profoundly affected our experience of those painful months and helped us see God’s mercy in our darkest moments, not because they defined our faith but because they expressed that faith within myth yet in a very tangible, real way. When I lived near Belfast a few years back, I took the CS Lewis tour. Whenever we got to a site which was related to a particular book, the guide would ask who had read that book. It soon became apparent that only I and a studious looking young man had read anything other than Narnia ! I hope the tour impelled the others to read more of Lewis and maybe even be converted. By the way, the guide showed us the rectory and church of the grandfather of Lewis, and the rectory door has one of those in- the- middle doorknobs just the height of a young child’s eye. It is in the shape of a Lion! Thank you for sharing such poignant and intimate experiences. Lewis, I know, would have been deeply touched. His own losses in life clearly inform his books – he was very tender about such things and not at all theoretical or doctrinaire. Foremost, he does not avoid death, including the death of children. I contrast this with things like the Potter books that are all about magic and dabbles with the problem of good and evil – but, I think, never really confronts it in the manner of Lewis. Both Lewis and Tolkien had seen action in the trenches of World War I and lost their dearest and best of friends (more than one) in that hellish nightmare. All that they did and wrote must always be seen with that backdrop. They were men who had seen and faced the worst the world has to offer. Lewis lost his mother while still young. Tolkien was orphaned at age 12. Their lives would have been meaningless and filled with absence had their faith avoided the ultimate and most tragic questions. Neither man’s faith was “romantic” or “sentimental.” Neither were they grasping at straws and merely looking for comfort. They were of a generation that were brave atheists when they did not believe (unlike many moderns). My own life experience, while never having to endure the death of a child, was early on marked by certain poignant experiences of loss (a murder in one case). My thoughts by age ten were quite dark. Lewis and Tolkien both had a very profound effect on a newly-found faith in my late teen years. They awakened something in me – perhaps the heart that responds to the mythic. By my early 20’s I had discovered the fathers and began to occasionally read the little Orthodox theology that was in print in English. That became a compass in my life that has guided me since to this larger, brighter world we now inhabit. Sadly, the trenches remain and the loss of friends and the loss of a world (the Classical) have not abated. But the brighter world continues to “inform” the present. That is a rich word – “inform.” For those brighter forms are constantly giving a redeeming shape to a world that would be formless without them. They transform a stuffed toy into God. In my experience at the grave of a still-born son, it was a bull-dozer that bespoke and revealed the Presence. Happy are they who see the Day of Jesus. Seven or eight years ago I visited England, Oxford and the Kilns. We went out to the Church where Lewis is buried. We looked around and found a gardener who showed us to Lewis’ grave. “It’s only the Americans who come,” he said sort of wistfully. There is a lovely window in the Church dedicated to Narnia – given by a family that lost a daughter, as I recall. I rather wonder if he would have approved the window. This is somewhat beside the point, but I also watched a new (and quite worthy) film at the recommendataion of my brother, which mentions Lewis. It is called “Heaven is for real” – based on a true story of a near death experience of a 4 year old. Although it is easy to find many things wrong with the film, (not so much because of its ‘Nebraskan Protestant’ starting point, but) because it sets the bar so incredibly high (even depicting Heaven and Christ at some points) that it is naturally bound to fail miserably in some sense; it is far more preferable than the usual films that set the bar low and clearly achieve the ‘abject’ target they have set themselves however – appearing outwardsly impressive. Back to my question, does anybody know of Lewis’ awareness of Orthodoxy and its notions that seem to inform so many of his works? There are a number of tales (some apocryphal) concerning Lewis and Orthodoxy. It should be remembered that he died in 1963, which is only about 4 or 5 years after the conversion of Met. Kallistos (Timothy) Ware – who was repeatedly rebuffed by Orthodox priests telling him to go back to his Anglican Church. It sounds astounding today – but was not uncommon. I got the same treatment in the 70’s. But his comments (few) concerning Orthodoxy were all quite positive. Interestingly, he greatly disliked organ music and seemed to prefer Greek chanting. Most of all, he was well versed in a number of the fathers – especially Athanasius – whom he not only read – but understood. He largely avoided doctrinal and Church conversations – though he did write sharply against the notion of women priests – something that has brought him lasting antipathy from the Anglican powers today. His background was “low” Anglican (Northern Ireland), but he never seemed to be part of the Anglican Evangelical wing of things. All of the Churchmen contacts were at least “High Church” though not very “Anglo-Catholic”. That distinction I leave for those who, like me, once lived in that world and understand its subtleties. They are, necessary to understand 19th century England, and the first part of the 20th, but are largely nothing any longer. I attended an Orthodox gathering with about 800 priests in 1999, where Met. Kallistos Ware made reference to Lewis as “that anonymous Orthodox” and received an immediate, enthusiastic standing ovation. So, was Carl G. Jung right? 😐 The man was a gnostic as far as I know. Most “myths” that we find today in books, films and videogames are gnostic-minded occult/schizoid gibberish. What’s even more alarming is that many fantasy fans don’t even see the difference between ‘The Lord of the Rings’ for example and let’s say ‘The Elder Scrolls’ or ‘Baldur’s Gate’. Can a heavy consumption of such junk brainwash you? There’s Realism and Gnosticism. Jung doesn’t actually rise to the level of gnostic. He certainly saw value and meaning in myths, dreams, etc., but came to the conclusion that it was, ultimately, all psychological. It’s that he saw some form of a collective unconscious. But he would not and did not ascribe any ontology to it nor to anything else outside of the material. He respected religion as a function of our humanity – but did not actually believe in God. I read a huge part of his corpus in my college years. The fantasy that followed Lewis and Tolkien is largely, pulp fiction and not worthy of comparing to their efforts. It’s the failure of their imitators to understand them (much less possessing the breadth of knowledge that informed them) that renders their production so vapid. I would agree that fantasy can, like anything else, become just junk in the brain. Both Lewis and Tolkien would have agreed that some form of a Classical Canon should be required in education. The works being read in Middle and High School in the US today are only worthy of a facepalm. No oppression by an alien power could be more destructive to life and the soul that the stuff we are doing to ourselves (and our children). The love of truth through myth is one of the things that strongly drew me into Orthodoxy, though it took a few months of reflection to figure that out. I greatly admire those who create fictional worlds and use them to help us understand the “real” world even more deeply. I used to be a bit disappointed that we don’t have a Tolkien of Orthodoxy, but truth is Orthodox and Orthodoxy is truth. 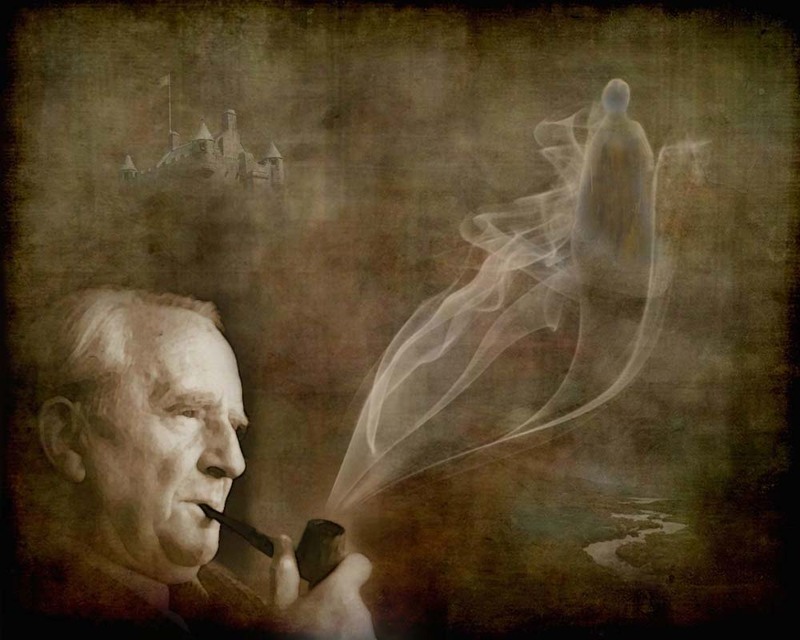 Therefore, we can glean much from the truth in the works of both Tolkien and Lewis. The Mass Effect series is about someone called “Commander Shepard” who saves everyone in the galaxy from the “Reapers”, a force of death that has come into the world because of something broken about sapient life. 1. Permanent destruction of the Reapers, saving many but also to the condemnation of many. 2. A total uprooting of ontological reality that redeems and reconciles the very foundation of the brokenness that caused the Reapers to be made to begin with, that goes completely against everything we know about worldly physics and biology. 3. Temporarily fending off the Reapers and delaying the inevitable. Having played the first two games about a year before my conversion, I now find it almost impossible to read these motifs in them as anything but the sort of not-quite-one-to-one Christian allegory far more inspired by Lewis and Tolkien than Lovecraft whose contribution would mostly be in the window dressing. To even further underscore the point, one of the unsympathetic factions, Cerberus, is an antagonist straight out of Lewis. They are the sort of people who will sacrifice everything for the “progress” of humanity but what they end up doing is, in the end, unmistakably diabolical. I’d say that, far from being a victim of Lovecraftian influence (and I say this as someone who has been a longtime fan of Lovecraft), ME represents the sort of change Chesterton was talking about when he said that fairy tales were important not for showing children dragons but showing them a Saint George who can fight the dragon. I suspect there could be similar salvific themes in the Baldur’s Gate series, but not that I can recall off the top of my head – certainly nothing nearly as obvious as in Mass Effect, but I do recall something about a long and difficult but never-hopeless road to redemption from a very personal ontological corruption being a major part of it. Here is the problem with such fantasy games/stories: they look from the wrong end of the telescope so to speak even if they involve ‘redemption’ as a theme, it is an earned redemption that, as you describe it, is little removed from the false eschatology of progress. Plus, the passions are more than a little involved. The fantasy is a type of fantasy that can easily lure one away from what is real. All I can say about Lovecraft is if you haven’t read him Don’t. If you have, stop. His work is demonic. I have loved the works of Tolkien for a long time, yet never really “got into” the fantasy genre (although I have enjoyed certain fantasy films), despite knowing several people (including my own father) who are fantasy fans and keep trying to “broaden my horizons” – There are even some fantasy books in my book-case I have been given or lent a while ago, that I have yet to read, and may never will. I am unfamiliar with Mass Effect, but the player character seems to be yet another instance of the “superhero”, one who wins by overpowering evil by being more violent and more destructive. A Nietzschean hero – a carnal salvation. The strange world of video games (and even movies) seems to me to be something of a perversion of Tolkien’s work and intention. It is useless to pretend that you’re in Middle Earth (or any such place). It is no longer mythic – but merely fantastic. The awakening of a desire for something Real and True and desire to pierce beyond the veil so to speak, is replaced with the passionate need to pretend. Little boys sitting in the dark staring at a screen killing dragons, etc., would probably have produced revulsion in Tolkien. The multiplication of fantasies that mimic Middle Earth (or the movies that distort it) create confusion – making it hard, especially for the young, to tell the diamonds from the rocks. They only see dragons, orc, etc. and never experience the depth of what is intended. The creation of the fantasy genre in its current form is almost like the production of the many false gospels mimicking the true. This is perhaps a very apt comparison. Not all who wander are lost. But some who wander do so cluelessly and fall off the edge of the world. What? Why do these comments now appear? There are accredited Jungian/analytical psychologists who would disagree with you on that! When I try to post a longer comment where I use words like “gnostic” or “occult” more than once it won’t appear… Must I censor it before posting? Nope. Why is this happening? The man was an atheist. He called his particular worldview “cosmicism”. “Nearly half of all Americans believe in the existence of extraterrestrials, and many are also convinced that aliens have visited earth at some point in history. Included among such popular beliefs is the notion that so-called ‘ancient astronauts’ (visitors from outer space) were responsible for historical wonders like the pyramids. Shocking new evidence proves that the entire genre of ancient astronaut books is based upon fictional horror stories, whose author once wrote that he never wished to mislead anyone. CME: Now there is a question that hits at the fundamental existential question. So that’s a lengthy explanation. Try sending them again. I think we’re in better shape. But if there’s a link, there will be a bit of a delay. I’m also up to my ears in parish responsibilities today, so my internet time is limited. Many thanks for your patience! I was being kind to gnostics when I suggested that Jung was not a real one. My thought was that he was merely psychological about these things, granting them no true substance. At least the ancient gnostics thought that there really were aeons, etc. I do not consider Jung worth much of a conversation. Gnosticism, as it describes various systems, is only useful as a collective name, but the name doesn’t signify much. Thanks for the article, Greg! Father, I’ve seen a few spam comments here on a routine basis but had not realized that the problem was anything near that big. I will keep you and anyone else helping you on the IT end in my prayers. The multiplication of fantasies that mimic Middle Earth (or the movies that distort it) create confusion – making it hard, especially for the young, to tell the diamonds from the rocks. They only see dragons, orc, etc. and never experience the depth of what is intended. Sounds a lot like what what was going on in my head when I first read The Hobbit after years of only playing fantasy computer RPGs and not reading any Tolkien or even anything (the word “else” is intentionally omitted here) in the fantasy genre. But it did provide an initial connection that many years later lead to my conversion as an adult. What I think my issue is, though, is that a simple condemnation or warning is going to fall on deaf ears without a sincere engagement from within the culture. That engagement must find and bring out what’s good inside that culture to be effective and not end up dismissed as an attack by ignorant outsiders. For those of us lost boys sitting in the dark staring screens killing dragons, the narrative assumptions we’ve derived from those experiences, however broken, are our starting point. By the way, with the exception of my first comment and my reply to Michael Bauman (regarding Lovecraft), you can delete my other comments (this one including) if you want — to avoid clutter. Besides, I will in one form or another probably repeat some of the things stated in the comment regarding Jung and gnosticism. CMI: I don’t have to immerse myself in demonic inspired writing to know that the demons exist and be on guard against them. Unfortunately, they most often don’t have to bother with me directly as I do their work form them far too often. This is an excellent article, Fr. Stephen. I am particularly pleased that you pointed out that the truth of myth should lead us (as it did C.S. Lewis) to expect to see the death/resurrection theme of Christianity appear elsewhere in cultural myth “even if its various manifestations have deficiencies and discrepancies”. Too often people mistake this repetition as evidence that it is historically false, i.e. just a common story that humans make up, rather than seeing it as a primal truth we are being prepared to understand when fully manifest. As an aside, I am puzzled that you would classify labyrinths as “a hapless invasion of New Age nonsense” in your comment on 7/9 at 8:22 AM. Labyrinths have quite an ancient history. Though not originating in Christianity, they have appeared in Christian churches for centuries, apparently with some role in prayer or meditation. I cannot venture a guess as to what Lewis would think of the idea, of course. The need we all have as Christian disciples is to die to the need to be original in order to be original. Innovation as novelty is not our calling. Creativity as the dynamic and wonderfully diverse expression of what is never changing is the call. One approach views the gospel and it’s presentation as somehow always in need of improvement as if it is somehow deficient and in need of our enlightened tinkering. The other views the gospel and the li out of it as the continuation of the creative majesty of the Word of God. We need to become/be true to the original. Then we become true by grace.